Recently re-mastered and with a trove of unearthed outtakes, Exile On Main Street continues its long, strange life as the odd-duck and simultaneous standout of a massive Rolling Stones catalog. The roots-driven, blues-heavy raw sound is the end result of a now mythic, months-long recording session in a decaying mansion in France. If you equate the Stones with rooster-strutting and gleefully calculated sleaze, you will be surprised to find no gimmicks here…just great, great music. Organic, alive and energetic, with all of the studio polish rubbed away, Mojo is Tom Petty and the Heartbreakers doing what they do best: rockin’! Petty’s southern brand of rock ‘n’ roll poetry is still in full effect, and the band still has their sense of humor. After 34 years, their rock ‘n’ roll spirit is as strong as ever. Classic science fiction like War of the Worlds, Fahrenheit 451, and I, Robot are so connected to the deepest questions surrounding our existence that they surpass genre and become stories about us. The 1946 classic Earth Abides is another “more than science-fiction” novel. A dystopian vision of a civilization struggling to exist after a pandemic has wiped out most of human kind, Earth Abides is affecting in its scope and timelessness. 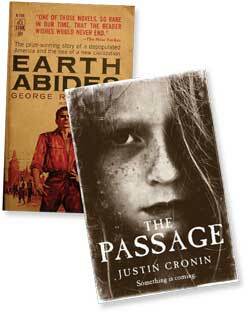 The media is already comparing Justin Cronin’s novel The Passage, to Stephen King’s The Stand. Cronin’s “future” centers around a plague of vampires, and the result of a military experiment gone horribly wrong. There is a light in the darkness though...in the form of a six-year-old girl. Plan on hearing more about this one...it’s already been optioned by Ridley Scott for a movie version. In the 1992 version of Cape Fear – another Martin Scorcese updated classic – a greasy-haired Robert DeNiro plays a memorably psychotic ex-con stalking the family of the lawyer that helped lock him up and scares the pants off of anyone who is in eyeshot. DeNiro terrorizes to perfection but it is the Oscar-nominated performance of Juliette Lewis that we remember. 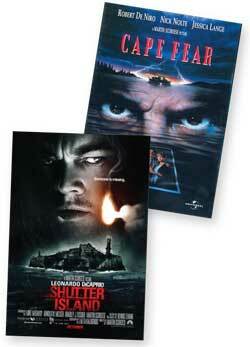 With more twists and turns than Highway 1, but every bit as aesthetically interesting, Shutter Island is a modern-day film noir energetically directed by Martin Scorcese, who dipped into his Hitchcockian bag of tricks to pay homage to the Master of Suspense and his films, most notably, Vertigo. Leonardo DiCaprio gives yet another game performance, begging us to ask the obvious: What does this guy have to do to get an Oscar, anyway?